Learning the time tables in a few easy steps! you can use your interactive whiteboard to make this easier and more fun! Skip counting in the 100 Numbers Chart is an effective strategy to start learning the times tables. Together with your students, you can explore the different number patterns that will help them recognize such patterns in the times tables. The next step is actually learning the tables. 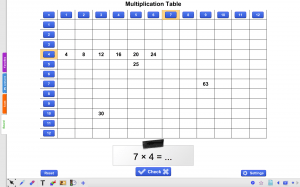 With the Multiplication Table, you can create multiplication sums and fill in the complete times table up till 12. How convenient! The only thing left now is memorizing. And we all know, the best way to memorize anything is to practice a lot. Activities like the Division and Multiplication Tester , the Sum Machine and the Times Table ‘Flashcards’ are exciting exercises on the smart board to use in class and to help engage your students!